Getting a quality night’s sleep is a problem that plagues millions of Americans. The CDC has gone so far as to document insufficient sleep as a public health problem, owing to the fact that up to 70 million American adults have sleep or wakefulness disorders like snoring, sleep apnea or insomnia tendencies. As you well know, poor sleep can have a significant impact on your ability to function in your everyday tasks. It’s hard to stay productive at work, maintain creativity, concentrate, remember things or have the motivation to pursue hobbies. Simply put, because people are tired, they spend more time on the couch and less time out doing the things they love. What’s more, insufficient sleep can be a serious hazard to one’s health, even leading to death. Lack of sleep over an extended period of time raises a person’s risks for depression, hypertension, obesity, diabetes and cancer. It also impacts one’s ability to drive safely. Studies show that a person who is tired is more dangerous at the wheel than a drunk driver. About one in 25 adults report having fallen asleep at the wheel, and it’s responsible for 72,000 crashes, 44,000 injuries and 800 deaths every year. Many products have been created to combat this growing health problem. Now, makers of a new smart pillow believe that their product can cure these sleeping woes and help people everywhere reclaim their quality of life. REM-Fit, a company that makes products devoted to improving one’s sleeping habits, has recently released plans to develop a smart pillow called ZEEQ that will track sleeping habits, prevent snoring, and help lull you to sleep when you’re unable to fall asleep naturally. “ZEEQ is not just another device or accessory, it is an active participant in your sleep,” say the makers on their Kickstarter pitch. 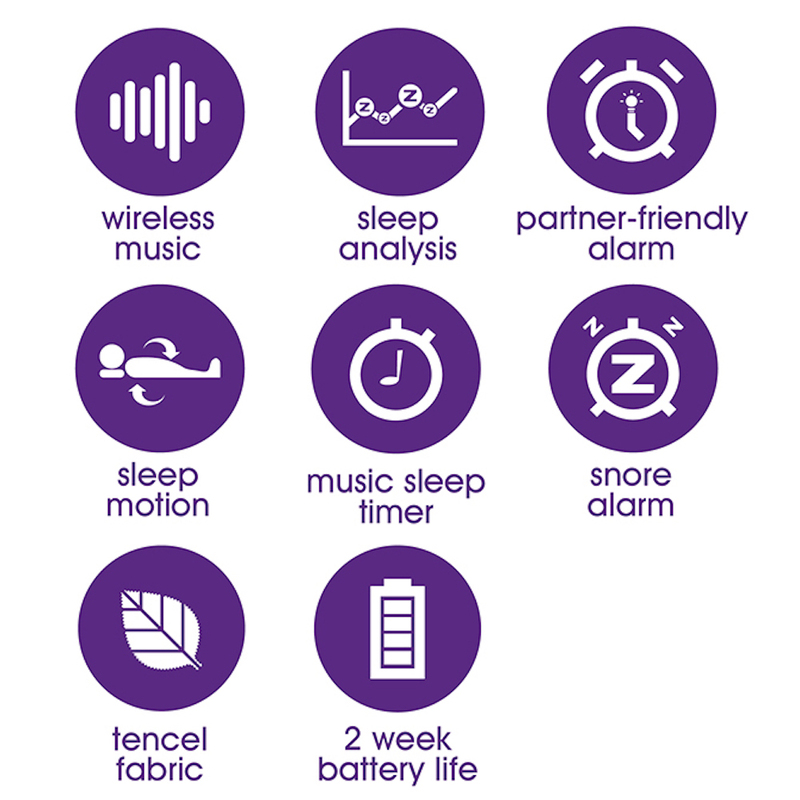 The fundamental capability is monitoring and tracking sleep, however it also has sensors within the pillow that connect wirelessly with an app on your phone. It will record natural sleep movements and the time spent in each sleep cycle so that you can keep track of the quality of sleep you get daily. 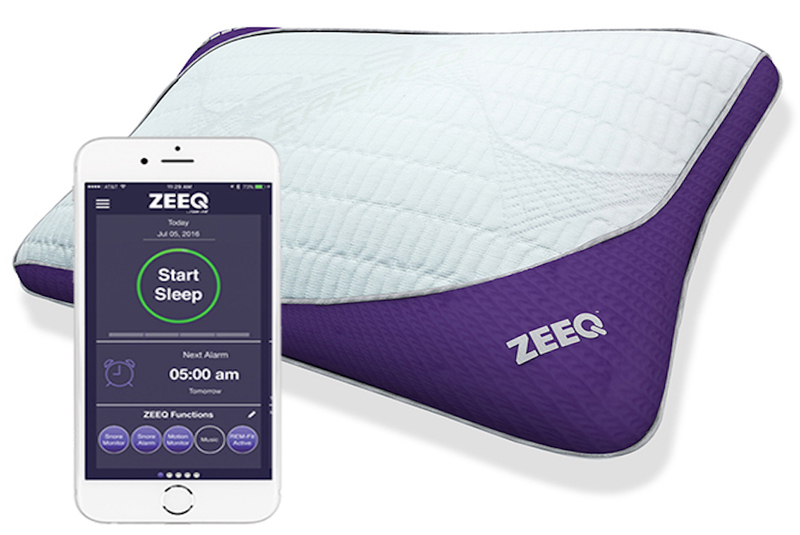 “ZEEQ integrates into your existing sleep habits and improves your sleep without you even being aware of it,” the makers report. The smartphone app can log information about the quality of sleep as well as a Snore Score to alert you of any snoring problems you might have. The app even goes one step further to promote a more holistic approach to health by tracking your diet information, exercise and other healthy habits to see how each of these components affects your sleep. If you’re exercising or eating too close to bedtime, the app will alert you and help you change your schedule to best promote your health and ability to sleep well. The sensors do more than just track data, however. They can also wake you up at the right moment as being pulled out of sleep at just the wrong moment can leave you feeling groggy for several hours in the morning. ZEEQ will take into account a timeframe in which you want to wake up in the morning. It will sense the point of sleep in which your sleep cycle is light enough to wake you without harm to your cycle. Then, it will vibrate softly or play music to help you wake up easily and gently. If it works as well as the makers say it does, you’ll wake up feeling more refreshed and ready for the day, no matter how much or how little you slept. Plus, the vibration is quiet and gentle enough that it won’t disturb your partner. 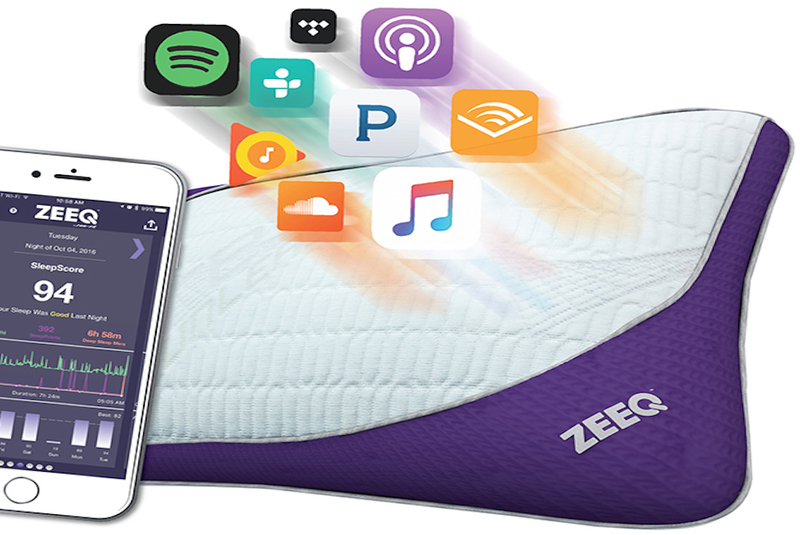 If you struggle with falling asleep, ZEEQ takes care of that as well. It can help you fall asleep by playing gentle music. There are eight wireless speakers throughout the pillow that connect to your smartphone. You can play anything from Google Play and iTunes as well as listen to audiobooks or podcasts as you try to drift off to sleep. When you’re falling asleep, you can set a timer so that whatever you’re playing shuts off on its own. You can also set any of these tracks as an alarm to wake you up in the morning. Playing gentle tunes can help spark brain activity in the morning and get you ready for your day. One of the best capabilities of this revolutionary smart pillow is its ability to stop snoring. Every year, millions suffer from sleep apnea, which can significantly diminish sleep quality for yourself and your partner and can even lead to asphyxiation in your sleep. It uses the motion sensors within the pillow and a decibel-tuned microphone to monitor your snoring, detecting the severity of each snore and sensing how much you’re moving. When the snoring gets too intense, the pillow will vibrate softly to encourage the sleeper to change positions and ease up the airway. This helps snorers switch to a better position sooner, getting a higher quality of sleep and avoiding any risks of asphyxiation. Your partner will thank you as well! Like any smart device, ZEEQ requires power to work. It runs on batteries and needs charged about once every two weeks, depending on the capabilities you turn on while you sleep. The comfort level is obviously a concern to potential users when they think about the speakers and wireless monitors sewed into the pillow. However, that’s not a problem at all, according to reviewers. Even with all the inbuilt technology, it seems to pass the comfort test, ensuring that you won’t wake up sore from a poorly designed pillow. The cover is also removable so that you can adjust the comfort-fill and wash it when needed. ZEEQ has been on the market for a few months now, with each pillow costing $299 a pop.